For more than 20 years, Shin Mineishi, MD, director of the blood and marrow transplant program at Penn State Cancer Institute, had treated acute myelogenous leukemia (AML) according to the long-established paradigm focusing on allogeneic stem cell transplant. In the past five years, however, he has begun to see a shift in that paradigm with transplantation being the center piece of a larger treatment sequence. The new approach emphasizes pre-transplant therapy and post-transplant maintenance together with the transplant itself to improve the transplant outcome. Over the next several years, Dr. Mineishi and his colleagues at the Cancer Institute will be conducting numerous trials to test aspects of this new paradigm. 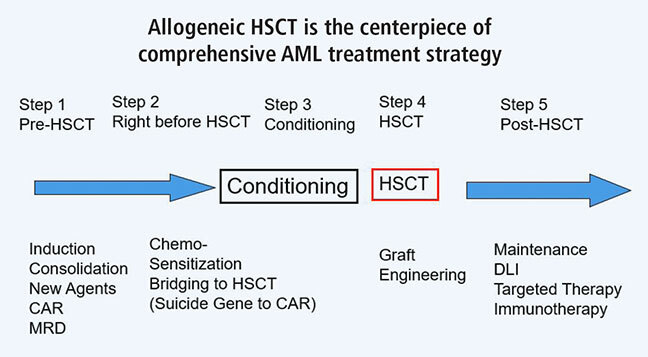 The new paradigm of acute myelogenous leukemia (AML) treatment, illustrating the importance of post-transplantation maintenance therapy following hematopoietic stem cell transplantation (HSCT). FELLOWSHIP: Medical oncology, Memorial Sloan Kettering Cancer Center, New York, N.Y.
http://ecog-acrin.org/. Accessed September 7, 2016.